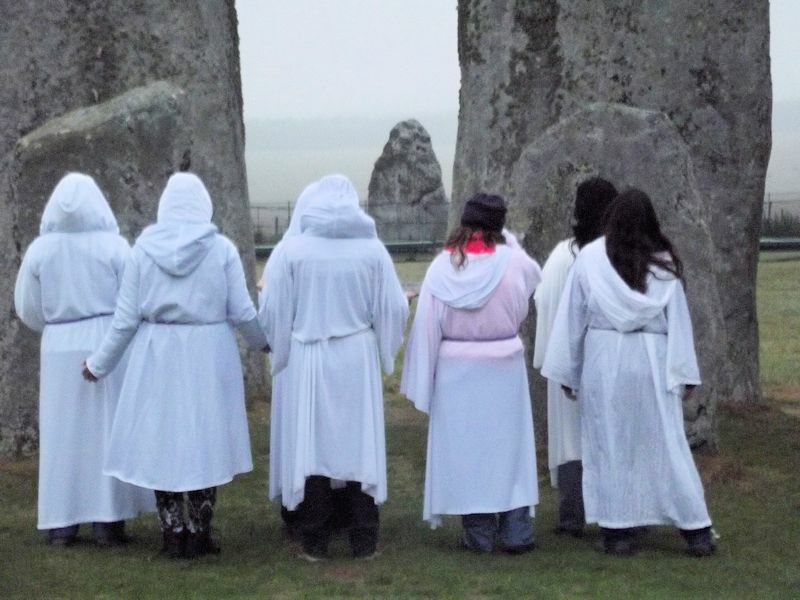 A look at Druid clothing in history, how ceremonial clothing is used by present-day Druids, and ritual clothing tips and resources. 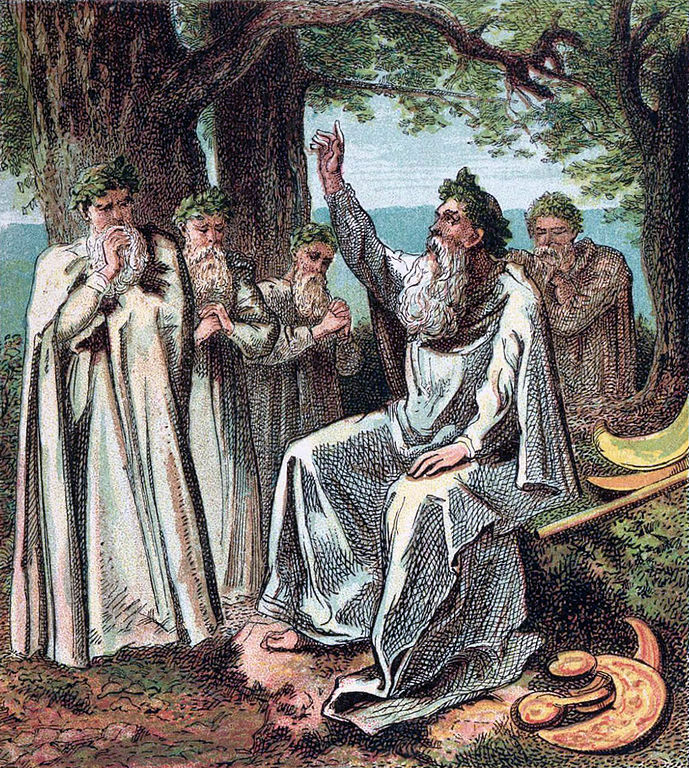 There is limited information on what the ancient Druids wore. 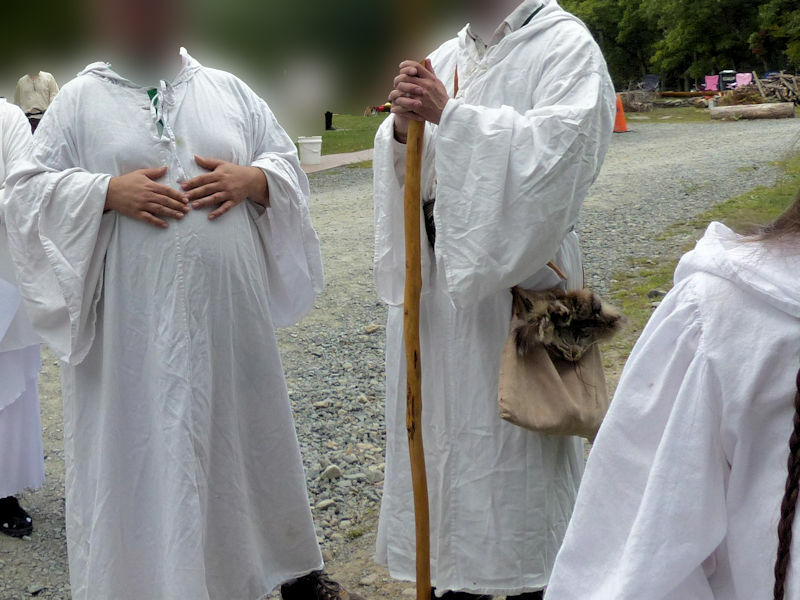 Greco-Roman, Medieval Irish, and later Irish and Scottish folklore sources indicate Druids wore white garments (not robes- this resulted from a mistranslation from the Roman historian Pliny’s account). 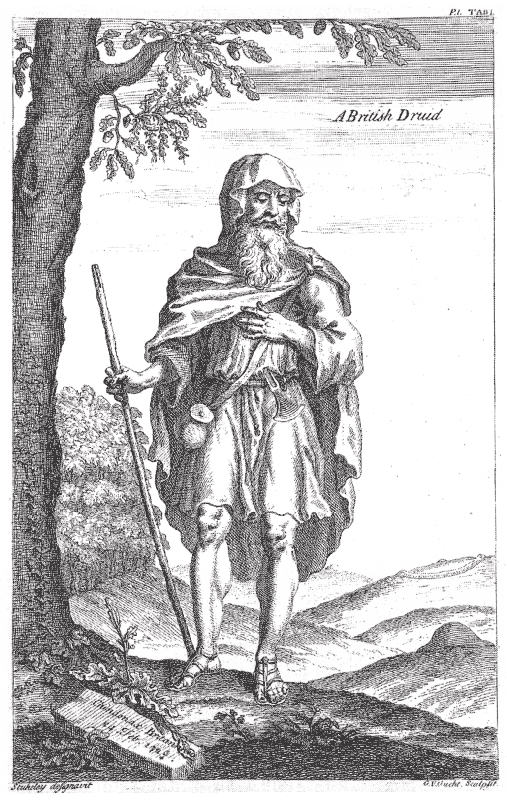 There is more data for what the Celts generally wore, and it is likely Druids would have worn a tunic and cape and/or tunic with a skirt. 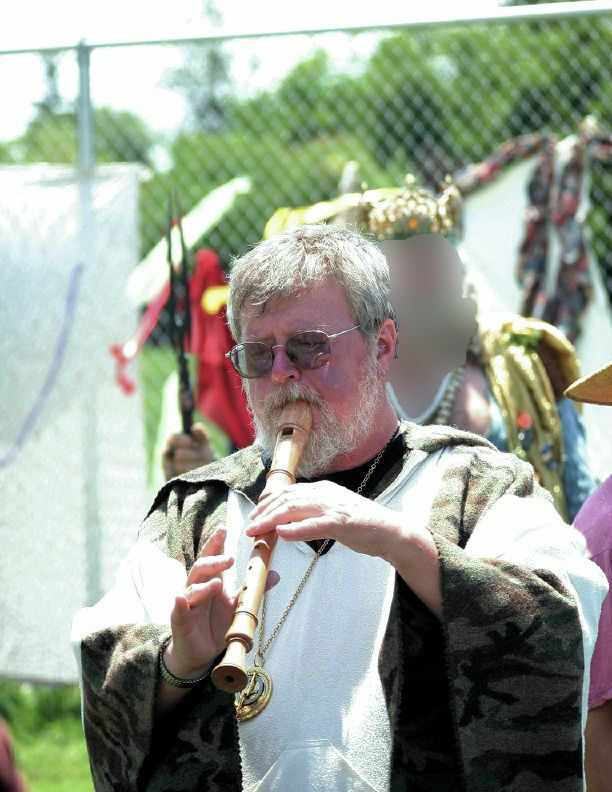 Regardless, there is little definitive evidence about what Druid clothing specifically consisted of. 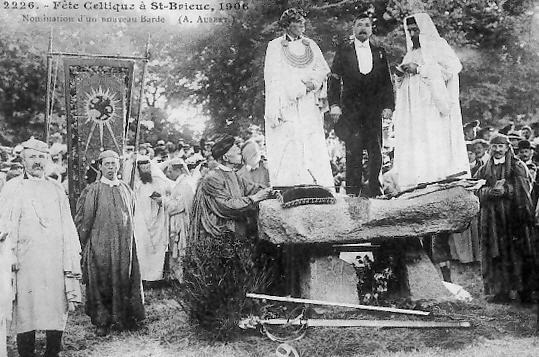 The early Revival Druids also believed in and held public rituals (documented with photos in the early 20th C), and currently there are large cultural Gorsedd festivals where participants wear the ‘standard’ Revival white robes. The slide show in this section shows images of Druids from over 100 years ago, and they are still in common usage. 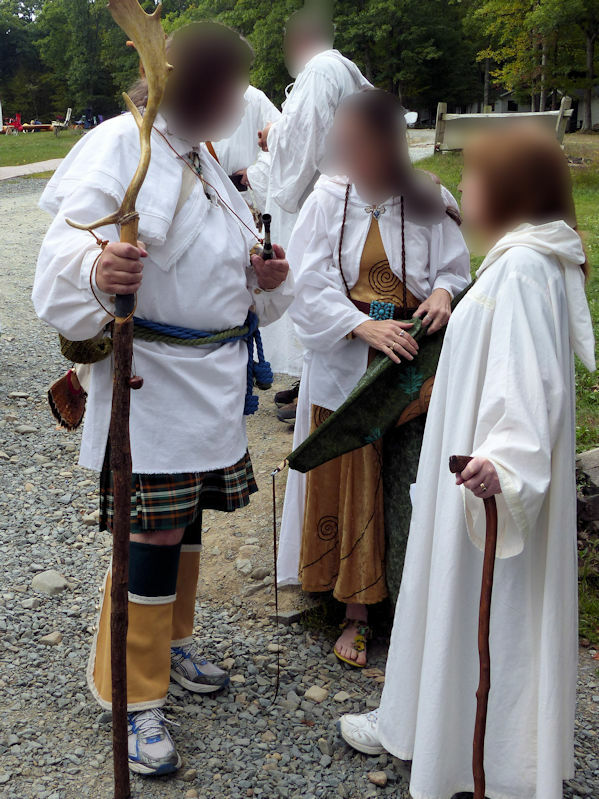 These images don’t accurately reflect the ceremonial garb of most modern Druids, but do illustrate the stereotypes about what Druids wear. 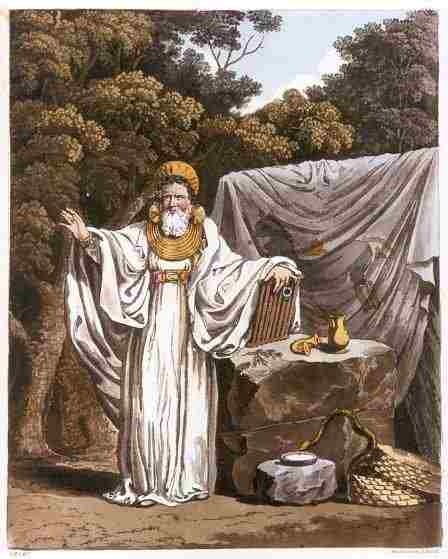 Druidic Vestments-Llewellyn Encyclopedia. A quick, to the point overview. ‘Celtic’ Clothing (with Greek and Roman Influence) from the Iron Age-a Realistic View Based on What We Know (29 pages). A very nice survey of recent research, with photos. 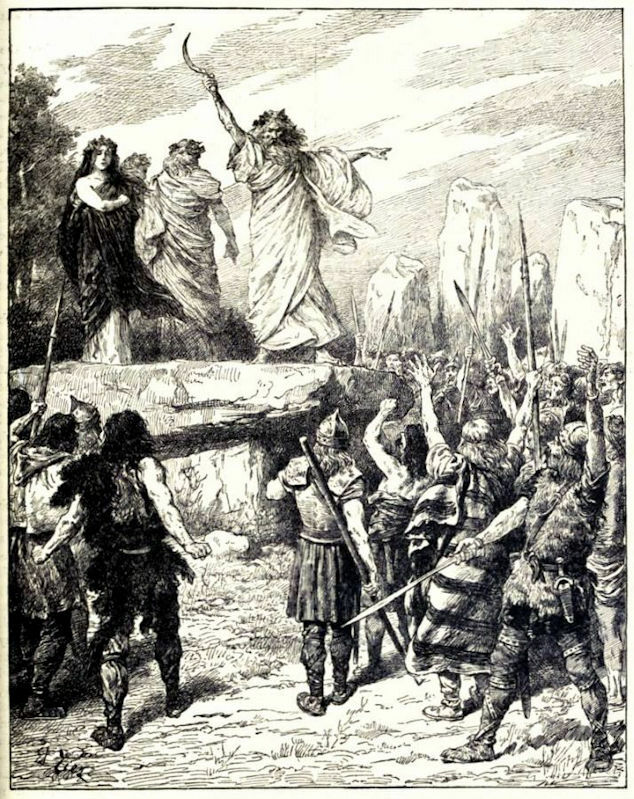 War, Women, and Druids- Eyewitness Reports and Early Accounts of the Ancient Celts By Philip Freeman. This book looks like it could be a good general resource on the Celts. Some groups will encourage wearing ceremonial clothing for special occasions- like Order anniversaries or initiations. 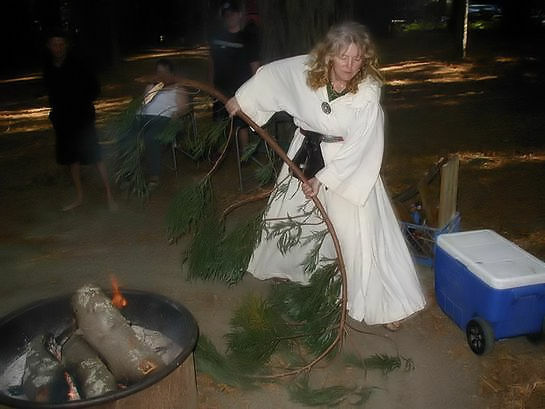 Most of the Druids I’ve come across in the United States are fairly casual, and seldom get concerned about wearing the same ‘uniform’. 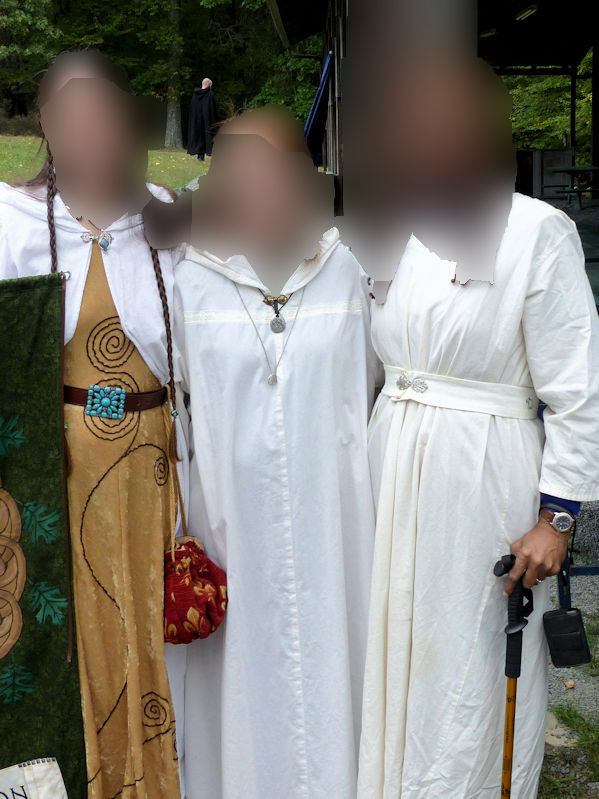 Here are some examples of modern Druids in their ceremonial wear, mostly from the last decade in Ireland, the UK, and the United States. 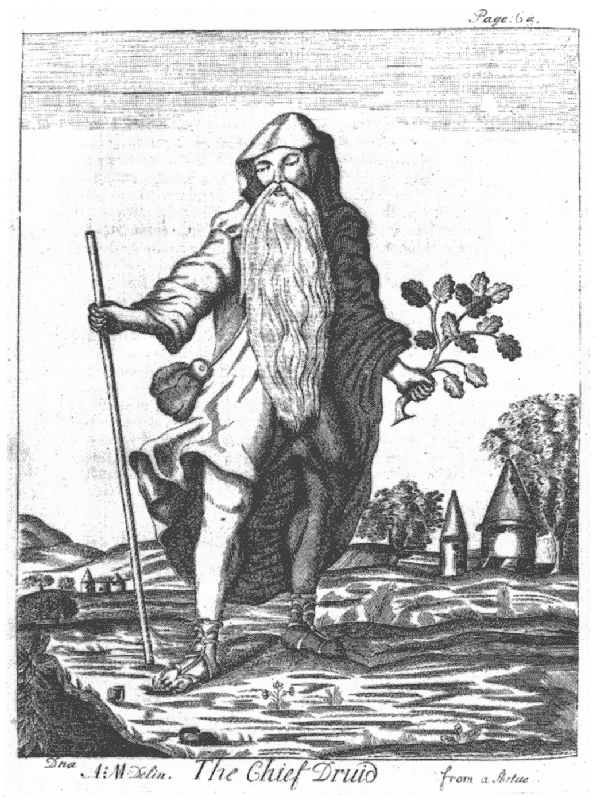 Symbols of Druid Identity– by Isaac Bonewits (on ADF uses). 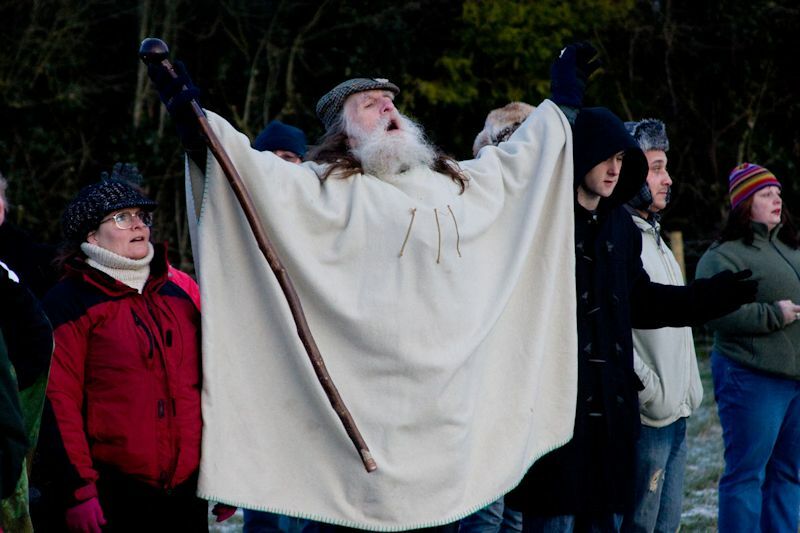 Druids and Their Robes – by John Beckett. 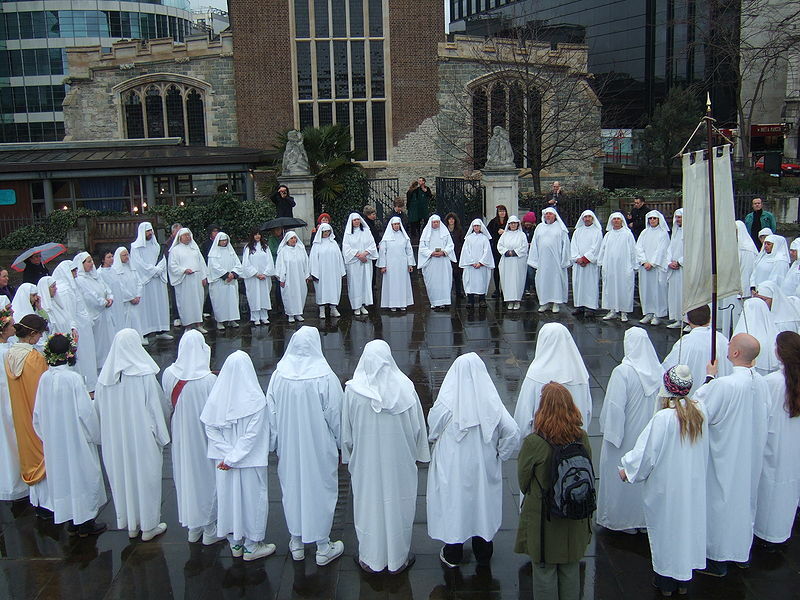 Several Druids talk about the ‘whats’ and ‘whys’ of our robes. 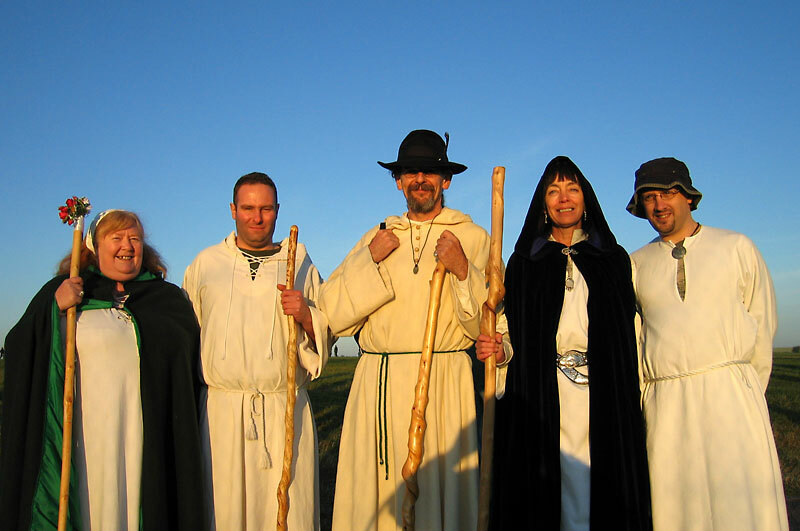 California Druids in 2008, wearing a variety of robes and cloaks in many colors. 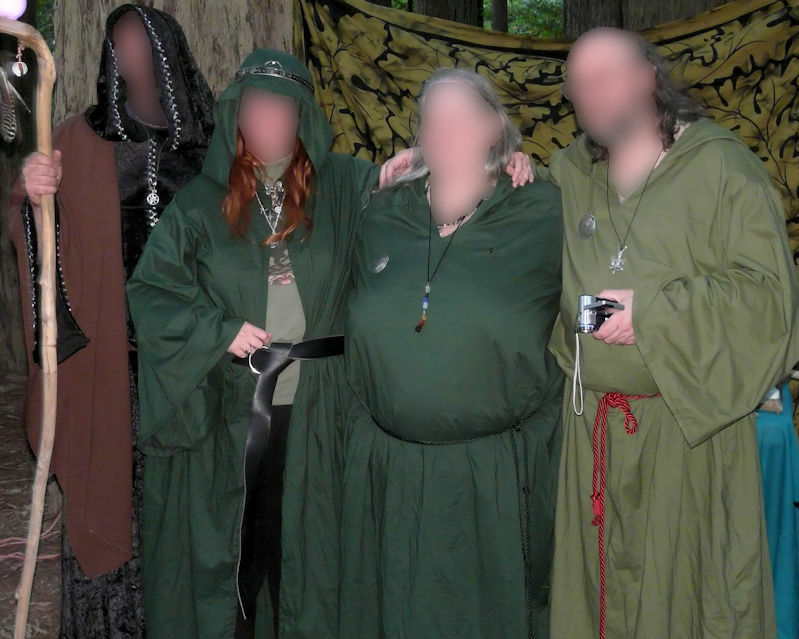 Northeast US druids, Fall 2013, wearing a variety of robes, cloaks, and dresses. Northeast US, September 2014. Ladies in three different robe styles. Northeast US, September 2014. 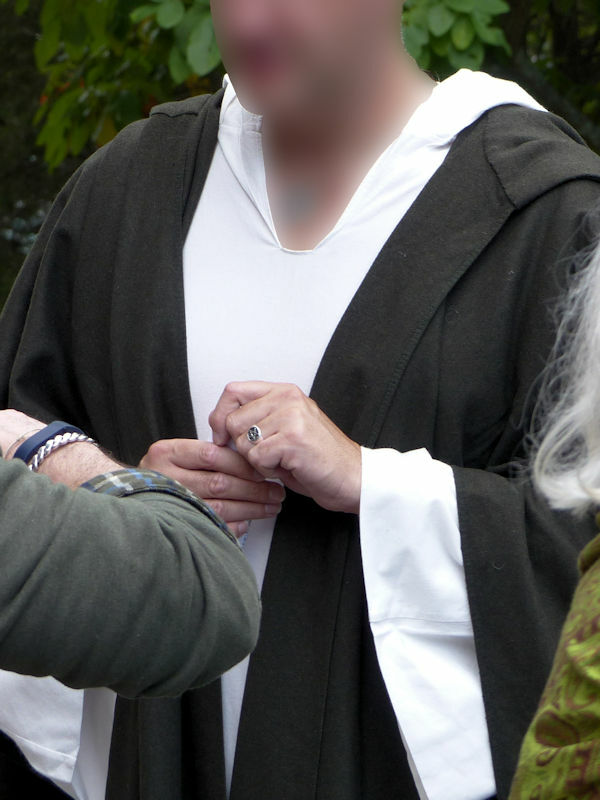 White robes (what I would call tunic style with wide sleeves). Northeast US, September 2014. 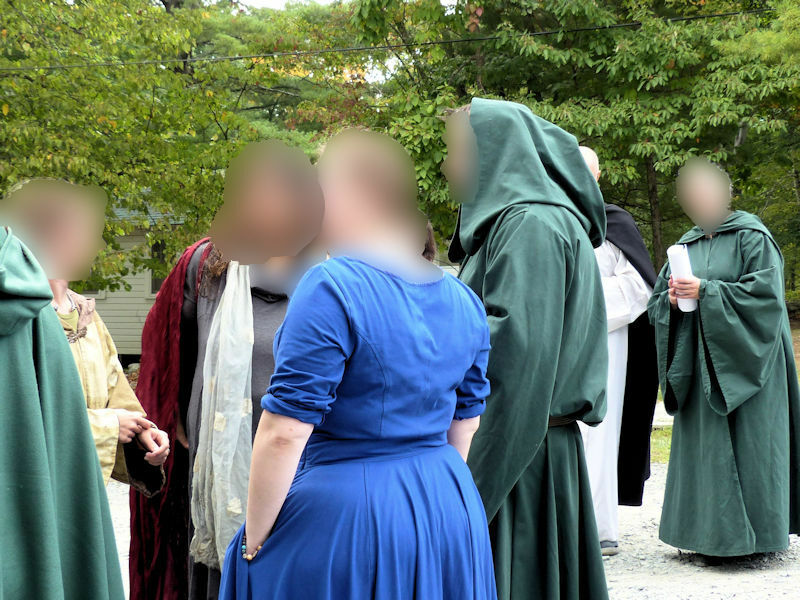 Ladies in robes, and gent in short tunic over kilt. Northeast US, September 2014. 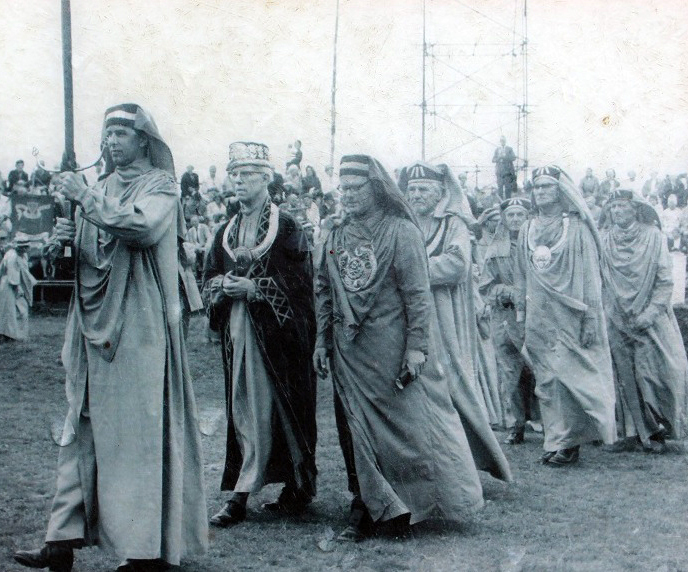 People in tunic style robes, and one gent in kilt with tabard over it. Northeast US, September 2014. 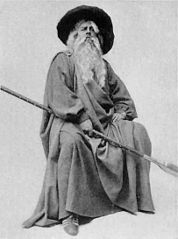 Gent in robe with open tunic of different color on top. The late James Bianchi in a robe with camo trim & hood, California, US (June 2006). 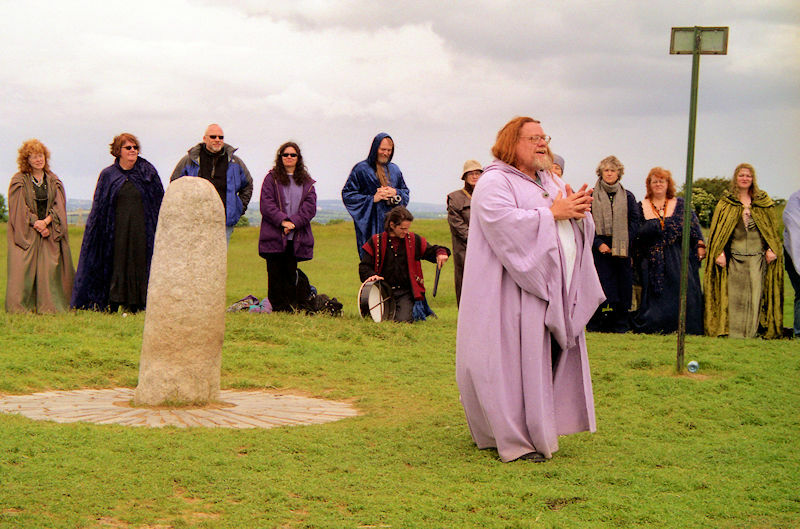 Sightseers on a Stonehenge tour. See how thin material will let your clothing underneath show through? (I'm guessing they were provided with these "robes"- all with the same belts- on the tour.) Stonehenge Sunrise Ceremony. July 2013, by Stonehenge Stone Circle, CC BY 2.0. Some ‘how-to’ articles and pattern suggestions to get you started. Robes tend to be fuller in the body, so the drape of your fabric will be important. Tunics & Tabards tend to be slimmer in the body, so fit is important. One easy way to make a tunic: use one of your loose t-shirts as a pattern for your tunic. 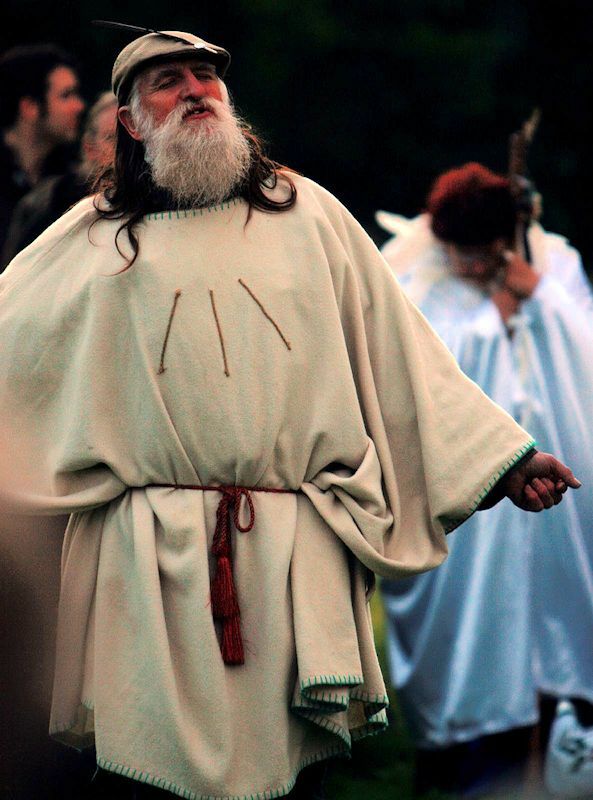 Echna’s Celtic Re-Enactments Clothing Page – information on leines, cloaks, tunics, etc. 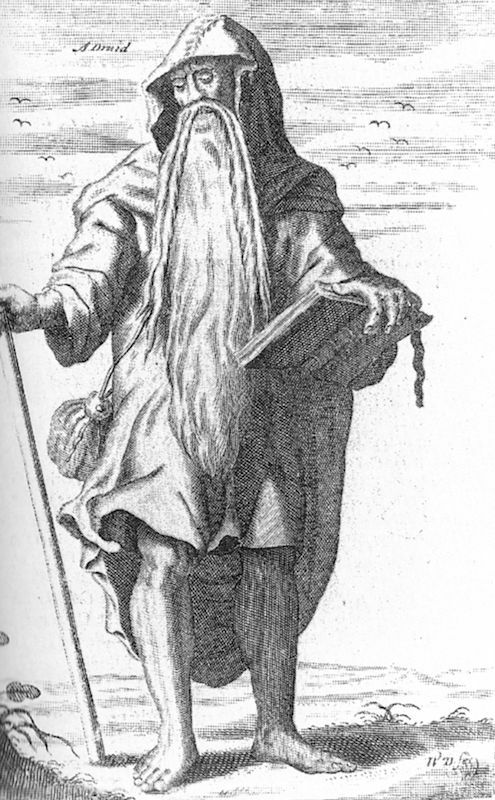 Cloaks are very full, and work best with fabrics that drape well and are heavier in weight. Shirts, vests, jerkins (like long fitted vests, some with sleeves), and the like can be layered. 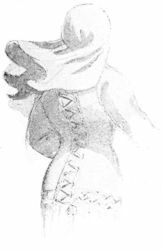 Using a large pinned shawl for several styles of wrap tunic, etc. An online search for ‘Druid robes for sale’ now yields many sources of ritual wear. You can also search for tunics, robes, tabards, etc. Suppliers can also be found on venues like Etsy or Ebay, where they are more likely to make you a custom piece. Hot, or cold- dry or wet; outside in the brush, or by a fire; sunny or windy? 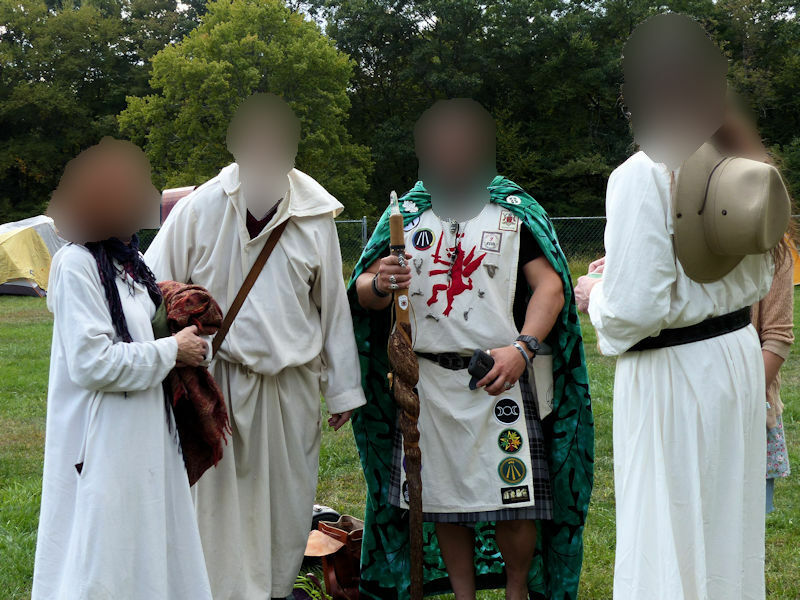 If in North America, could your garb be confused with the regalia of the Ku Klux Klan (a racist organization that wears bleached white robes with pointed head coverings)? I strongly recommend the use of natural fabrics for ritual clothing. They tend to wear well, are easy to sew and repair, breathe in hot weather and keep you warm in the cold, and are less likely to catch on fire and/or melt on you. 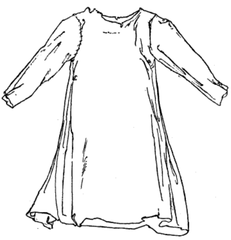 This includes – cotton muslin, denim, broadcloth and similar fabrics; silk, especially silk noile (AKA ‘raw’ silk); wool (if you live in a place that is still cool enough to wear it); and linen. Consider the different ways you can use your chosen clothing. After realizing many of my summer rituals would be out in 90-100+ degree weather, I came up with a cooler method of wearing my long robe- I push the sleeves inside, secure the robe at my neck, and wear it open like a cape with cool clothing underneath. (This has worked out quite well.) To deal with our changing weather, some people just use capes with seasonally appropriate clothing underneath. Kilts can be warm or cold, depending on fabric and on whether they are worn with or without tall socks and/or boots. 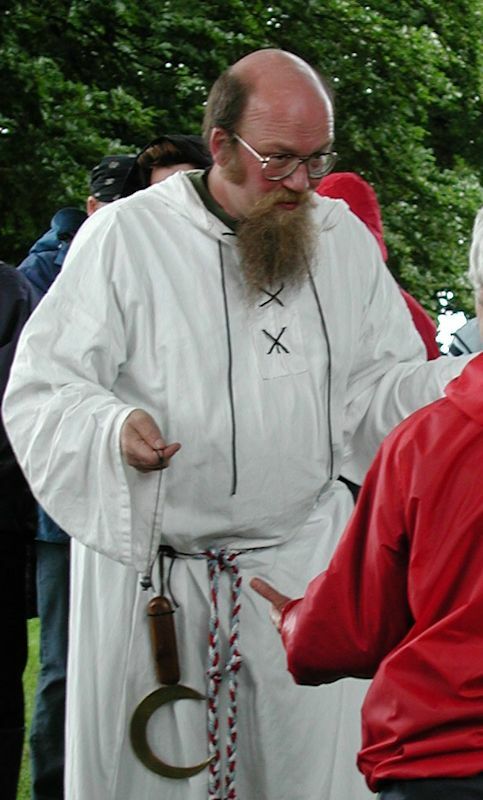 Some people will use a basic tunic, which they layer with tabards/jerkins, shawls, etc. There are lots of different ways to make your clothing work. Northwest California, US (September 2006). This is a full, belted robe. I made it out of off-white raw silk (silk noil), based on a choir robe pattern. ( I started with a pattern similar to this one.) Instead of putting in the sewn in front pleats I left them out and added a hood. I then lap over the two sides and wear it with a belt. I’ve used this robe for over a decade and it is still in excellent shape. 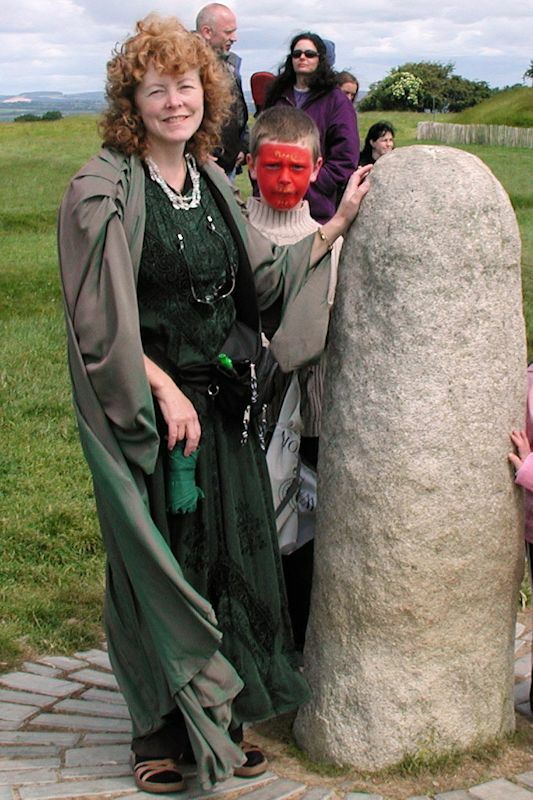 Your author at the Hill of Tara in Ireland, June 2004. I made this open robe without a pattern. It has pleats at the shoulders, and is made of 1940’s green and rose colored shot silk. The robe was easy to transport, but the antique fabric is weak now. This Druid Robes page was originally published on December 20, 2015.